Benoit Allaire has been the New York Rangers goalie coach for the past 13 seasons. There was a writeup about him in the New York Times circa 2006. That means he’s been around for the entirety of one of the greatest goaltending careers in the history of the sport. Henrik Lundqvist isn’t the greatest goaltender of all time — that is, of course, Dominik Hasek — but as the years go on and the .920 seasons keep piling up, his name pushes closer to the Big Three: Hasek, Patrick Roy, Martin Brodeur. It’s very difficult to see yourself living through history, but you look at what Lundqvist has done in delivering 12 straight seasons of being better than league-average (and usually much, much better than that) and you have to say few goaltenders have ever been this good or even close. The air is rarefied. So here’s a question for you: How much credit do you give the guy who has been the team’s goaltending coach for Lundqvist’s entire career? On some level you get to say that it’s a talent-driven thing. Lundqvist is one of the four or five greatest goalies ever already because that’s what his talent level is. But on another, you have to say he doesn’t get there on his own. Lundqvist came to the NHL fully formed; he went .922 across 50-plus games as a rookie, which is amazing and should have won him the Calder and probably the Vezina (the league average sv% that year was just .901!). Even if you think Lundqvist is a freak who would have done this anywhere with any goaltending coach — I don’t necessarily believe that but let’s say it’s true — you have to also consider the kind of work Allaire has done with all the backups the Rangers have had in that time. I’m just gonna take the data from the shootout era, which cuts off the first few years of Allaire’s career in New York, but the way NHL hockey was played prior to and following that 2004-05 lockout is very different. 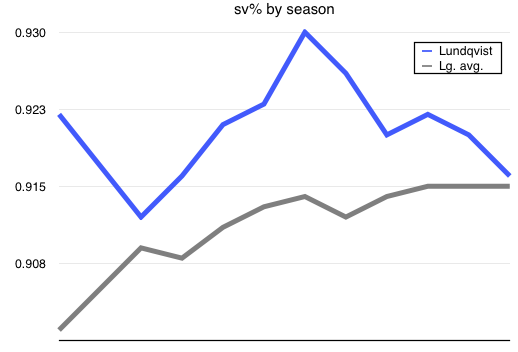 That’s seven seasons out of 11 in which Rangers backups were better than the league average. And it’s important to note here that you’d generally expect your backups to be a little below league average first of all. And second — and I think this is what’s really shocking — is that when the backups are guys brought up in the Rangers system, they tend to be well above the league-average number. The guys responsible for being below that mark: Kevin Weekes (2005-06), Weekes and Steve Valiquette (2006-07), Steve Valiquette (2009-10), and Martin Biron (2011-12). What do they all have in common? Career journeymen. 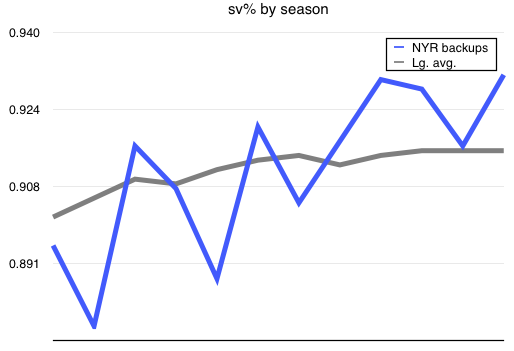 Valiquette also had a good year or two in New York, to be fair, but you see the pattern. If Allaire works with a guy in his developmental days, he’s lights-out. To be fair, the bulk of that is solely Cam Talbot, so maybe Talbot is just good as well. The numbers in Edmonton certainly suggest it. But if your two big career projects are Lundqvist and Talbot, well, maybe you’re just unreal at your job. This entry was posted in Fundraisers on November 30, 2016 by lambert.